Mr. McGregor’s Daughter has organized a house plant census so I have dutifully counted up my indoor plants, including various hyacinth and narcissus bulbs. Included in my collection of house plants are some treasured plants that I have had for 23 plus years. The night blooming cereus, which I believe to be Epiphyllum oxypetalum, was entrusted to my care in 1987. Prior to that, I estimate that my Dad had it for 15 years, so it has been “in the family” for going on 38 years. That is a long time in house plant years. A house plant year*, by the way, is equivalent to three outdoor plant years, so in outdoor plant years, the night bloomer is 114 years old. She’s a venerable old lady of a plant and deserves all of the space she takes up in the sun room. Equally as old is a smaller night bloomer that I acquired from my aunt a few years ago. My aloe vera plant has been around in one pot or another, and often in multiple pots, for the better part of 25 years. The original plant came from my aunt and uncle, who got a start from my grandmother, who got one from her mother. Mine had mealybugs once, but I managed to eradicate those cottony-nasties and saved the aloe. What a scare that was. My pothos plants, two of them, harken back to 1987. I’m not one to let a pothos vine continue to grow so that you can wrap it around the room three times or do anything crazy like that. Every spring, I whack ‘em back and stick a few cuttings from the trimmings back in the pots so there is always new growth. ** I do this with a lot of my house plants, including the aloe. Other plants that should be mentioned for their longevity under my care include a Christmas cactus, a real cactus, pictured above, which I refer to as ponytail cactus, but it could be something else, and my Crown of Thorns, Euphorbia sp., which is always blooming. That cactus, by the way, has been in that pot for 15 years or longer. It has grow up and around and through that wire shelf so that it can not be moved. I guess it has taken its own kind of “root” in that spot. All together, I counted 47 house plants and bulbs growing in my house for this census. I do not have a large collection of house plants, by most measures, but if you add up the ages of the plants and how long I’ve personally had them or their cuttings under my care, I think I have a rather old collection. *I made that part up about “house plant years”. **Many gardeners claim it is more difficult to keep house plants alive than outdoor plants, but I don’t think that is true. One of the secrets to the longevity of some of my plants, other than the night bloomer, is to take cuttings of them to root before the original plant starts to decline. Then I have a back up young plant ready to take over if the original plant should die on me. The freeze got my NBC, I had no clue about it when my son brought it to me. Hubby and I potted it up and left it outside...oops! I love your ponytail cactus, not surprised at all with your success with houseplants. That ponytail cactus is one wicked looking plant. It has taken control of its habitat. The begonia I have is probably the oldest plant I have. I has been rejuvenated at least one time after a sever decline. I think it's amazing that you have had some of these plants for so many years, Carol. This is just another indication of your "green thumb." Loved your comment about pothos. Seeing stringy plants hanging around the room is not my idea of beauty. A friend had one stretched around her cubicle at work. Oh well, to each his own, I guess. Thank heavens your recent furnace-fail didn't drop the temps to where you lost that famous Cereus, Carol! I love the part about Houseplant years - maybe you made it up, but it sounds quite logical. I was pretty good at houseplants in IL but find it much more difficult in TX. Thanks for participating! You've got a way with houseplants, don't kid yourself. It takes the ability to keep a plant alive to be able to take cuttings. (Cuttings from dead plants are pretty pointless.) Your plants are more than just plants, they're stories and connections to people in your family, which makes them so special. That cactus is so cool! I love that your plants are long-time friends, or family members. My cutting from your NBC is healthy but not growing as much as I'd like. I'll repot in spring and move it to a sunnier window and see how it likes it. Maybe I should show it pictures of its "mom" to encourage it! I'm one of those gardeners who thinks growing indoor plants requires a different set of plant growing skills. Your plants are rather like pets...part of the family. I love that your houseplants come with pedigrees and ancestry! Carol I so envy you right now. But seeing your lovely cactus has re-ignited my interest in it. Carol, I love that you have stories about some of your plants- each one like a friend or family member-treasures of the past and gifts of the future. 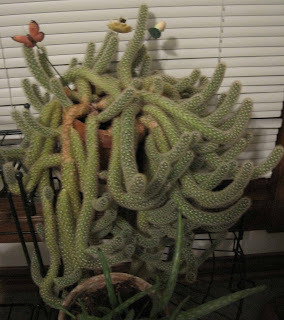 I have a similar cactus that has been in it's pot for maybe 15 years. Our Andrea brought it home from ? when she and it were very small. I transplanted it 2 into bigger pots, but it has grown way beyond handling now. Each March it rewards me with tiny white blooms and I am grateful for the memories it gives me. I luv the thought of houseplants being passed on from one generation to the next. That's one large collection of plants. My favorite is definitely the aloe vera.. we always used to use it on sunburns as we needed it by breaking off part of a stem. LOVE your cactus! Very cool history with your houseplants...none of mine are that old-yet. OMG, that is a huge cactus! I just found your blog and think i have found a fellow houseplant nut. You are doing something right to have so many old plants. I feel when all you do is water them , they don't thrive. I think you have to spend time with each one. Like a pet.I may be nutty, but that's OKAY. I was surprised to find I had 27 (29 if I counted the windowbox as more than 1 plant). Also, much to my chagrin, I have lost the names to several so am reduced to calling them "viney things" and "aloe types". Arrrgghh - now I have to go on an internet search before this drives me nuts!